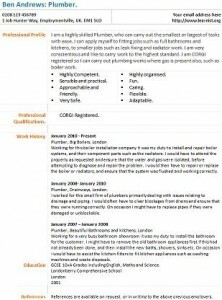 Plumber CV example and template. Amend as suitable and create your own CV in seconds. You can then apply for Plumber job vacancies where available. There must be thousands of Plumber vacancies on the job sites online and you can find many more on the local newspapers which you can apply with your newly created CV. Once you have CV done then it’s time to write a cover letter for your job applications. Here is Plumber cover letter example. If you have any questions about your career then visit our job seekers forums today. I am a highly skilled Plumber, who can carry out the smallest or largest of tasks with ease. I can apply myself to fitting jobs such as full bathrooms and kitchens, to smaller jobs such as leak fixing and radiator work. I am very conscientious and like to carry work to the highest standard. I am CORGI registered so I can carry out plumbing works where gas is present also, such as boiler work. Working for this boiler installation company it was my duty to install and repair boiler systems, and their component parts such as the radiators. I would have to attend the property as requested and ensure that the water and gas were isolated, before attempting to diagnose and repair the problem. I would then have to repair or replace the boiler or radiators, and ensure that the system was flushed and working correctly. I worked for this small firm of plumbers primarily dealing with issues relating to drainage and piping. I would often have to clear blockages from drains and ensure that they were running correctly. On occasion I might have to replace pipes if they were damaged or unblockable. Working for a very busy bathroom showroom it was my duty to install the bathroom for the customer. I might have to remove the old bathroom appliances first if this had not already been done, and then install the new baths, showers, sinks etc. On occasion I would have to assist the kitchen fitters to fit kitchen appliances such as washing machines and waste disposals.